Inspired by Frida Khalo’s work and life, Royal College of Art graduate Ambre Cardinal’s experimental dance short Un Ruban Autour d’une Bombe celebrates the artist’s contradictory facets of power and delicacy through the movements of a flowered headed dancer accompanied by a staccato score. Cardinal shares the pain of creating beauty to destroy in her film of self-exploration. From concept to final realisation Un Ruban Autour d’une Bombe took one year and two months to complete. The project started when I saw the Frida Kahlo exhibition at Musée de l’Orangerie in Paris. Beyond her work I really admire her personality. I just found it brilliant the way André Breton used to describe her as “un ruban autour d’une bombe”. I wanted to create an art piece that related to this woman who was full of contradiction and passion. 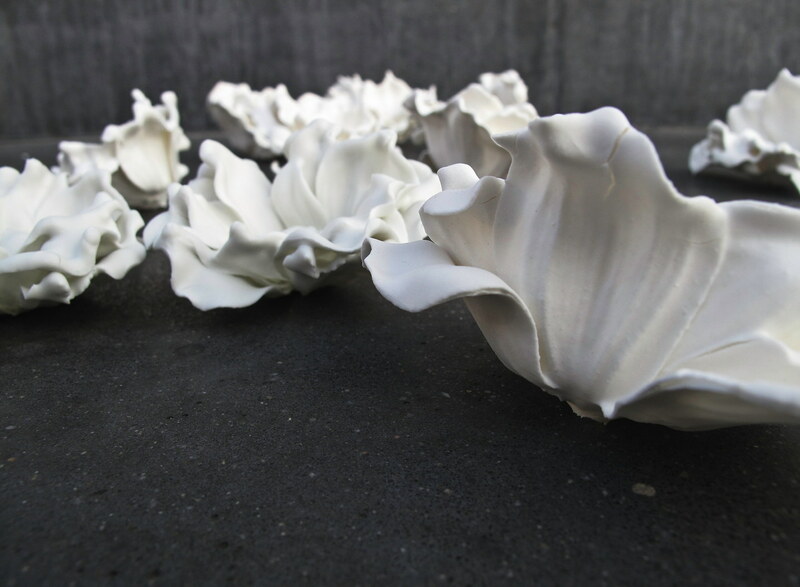 I used the flowers that Frida launched as a fashion statement at that time and dipped them in porcelain – I like the metaphor of fragility and pureness present in that material. The idea was to make a video, which followed the flowered head through a journey of exploration that led her to a space for self-exploration. Once I’d built a mood board, synopsis and made all the porcelain flowers I manage to find a super great team all willing to work in collaboration on my self-produced project to make it happen. We shot everything in two days with a Red Epic Anamorphic camera thanks to our DoP Kanamé Onoyama. The outdoor shoot had a good flow – the place was so unique with perfect weather. Our second shoot day in the studio was pretty intense, especially knowing that we’d only met Khady Khadyak, the dancer for the project, just a few days before. She did a really good job! Breaking our delicate white porcelain flowers was a tough job as well. We had many but the knowledge that they had been dipped in porcelain three times and Kiln twice made it a little bit painful for me to break them. But that was what they were made for. For postproduction we did everything at home with Final Cut. It took us a week to finalize to the final cut. When we first completed our sound I didn’t feel it really matched the atmosphere I wanted for this video, so I took the decision to work with another sound design team and it changed everything. At some point everything made sense and I felt satisfied with it.